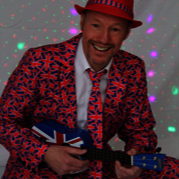 Gordon Bennett is a talented all round Cockney style entertainer and had the 'showbiz bug' from an early age, first performing in a junior school concert. He began working in pubs and clubs before he was old enough to drink in them, and over the years has worked in many different acts and spheres of the business, making the Gordon Bennett of today a polished all rounder. Music and entertainment are in Gordon's family with his Grandfather being an accomplished violinist and his Grandmother playing piano for the silent movies at a Tottenham picture palace and performing at The Hackney Empire. His Dad was born a Cockney with a tremendous sense of humour! Gordon would deny it by saying that he is his own creation, but he has been described as a cross between Chas 'n' Dave and Max Bygraves with a touch of Max Miller. Gordon gives a fresh lease of life to nostalgia often drawing large crowds and 'putting bums on seats' as the saying goes! 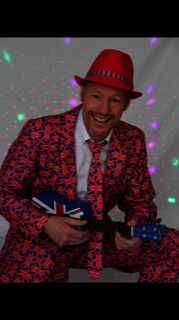 Now based south of London in the county of Kent, he has worked in venues large and small across the UK and overseas, has appeared on television and radio and before Royalty, and has made front page news. Performing his 'One Man Show' also working with several package shows, supporting star names, and when time allows charity work, Gordon is a busy act covering many miles each year and continues to be in constant demand for his special brand of entertainment.